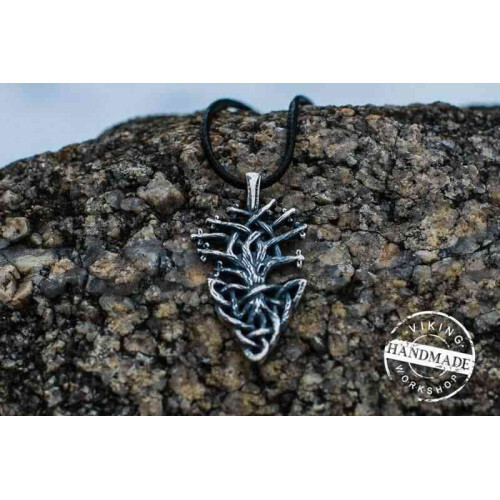 Amazing bronze pendant of the mythical Tree of Life is a perfect gift for those whom you want to guard and protect. Ancient legends say that the tree was a cross point of nine Norse mythical worlds. The deity gathered at the tree to solve troubles and problems. The tree features various meanings combining powers of sky, earth and sun. Moreover the tree performs extreme physical power and inner strength to resist to daily challenges. It was said that neither sun nor wind and water could defeat the tree of life. It represents freedom, wisdom, eternal knowledge and inner balance. The handmade pendant is a stylization, inspired by ancient finding, produced from bronze. It is crafted with great passion to details. The pendant comes with a durable cord (the cord may be different from the photo).